Since President-Elect Barack Obama’s election last week news has been flying fast. Here’s a few items that caught my eye. The sort of Web site the Obama team seems to be envisioning�one in which the president and his citizens hold deep discussions about the controversial issues of the day�will surely be much less focused than My.BarackObama.com, which had a singular goal: to get Barack Obama elected. Obama’s campaign Web site connected disparate people who shared a common passion; the White House social network will connect people who disagree with each other and with the president�and whose goals might be in conflict. So far, the Web hasn’t had a great record of bridging social divisions. If Obama can change that, maybe he really is a different kind of politician. On another topic, Obama adviser and transition co-chair Valerie Jarrett recently reiterated he plans to create a White House Office of Urban Policy. In addition to the new office, his picks for many other posts will have a profound impact on our cities, including three posts Richard Layman is thinking about: Secretary of Transportation, Secretary of Housing and Urban Development, and Director of the Federal Transit Administration. 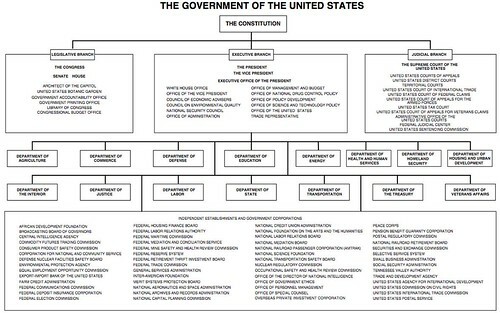 It is interesting that in that org chart that they don’t have “The People” included anywhere. I have seen several similar charts before and have often seen “The People” at the top. Just a thought. I agree with JohnD’s point. The box above the constitution should and would be “the people”.